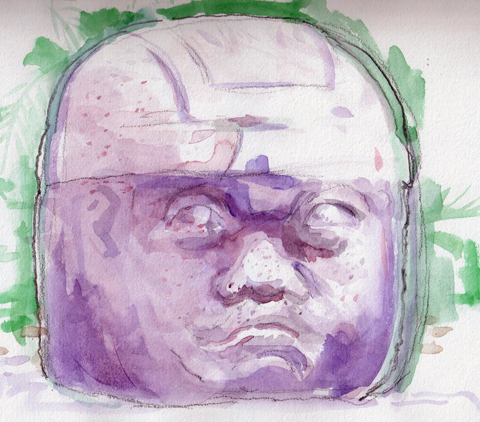 Olmec head, Parque La Venta, Villahermosa. Back in sleepy Kutztown after 6 weeks of traveling through the Yucatan and Belize. I carried a sketchbook and an Ipad. My most recent on-the-road blog entries were done on the Ipad. WordPress for IOS worked pretty well. It doesn’t have the full toolset or versatility of the computer version of WordPress. I couldn’t manage to add links, for example. 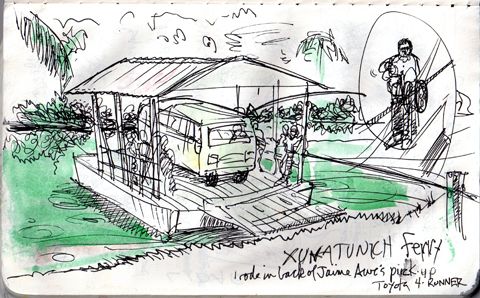 I know it is feasible, but it was beyond me working with ‘jungle-lodge’ wifi. At this point in time, a netbook or MacBook Air might be a better choice for remote blogging. My sketchbook was a softcover Moleskine. It, too, was not the perfect choice. It wilted in the Mexican humidity, the perforated pages near the back came undone and ink from the cover bled into the edges of the interior pages. (See sketch below.) I know, it is the poor carpenter who blames his tools, and Moleskine has a devoted following. A more expensive hardcover Moleskine would have been a better choice. In the past I’ve used Cachet, Canson, and Holbein sketchbooks, all good products. Selecting a sketchbook is a very personal matter. Consider the media you use, and be realistic about the size and weight of the book you are prepared to carry. 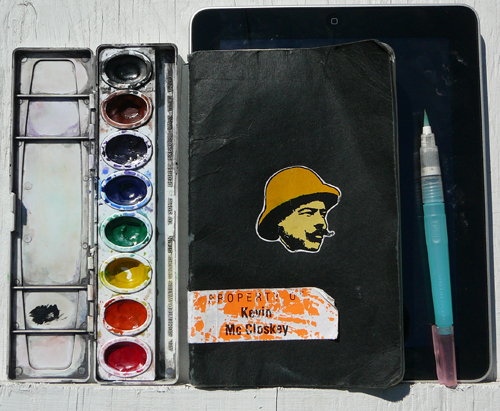 Back in my youth I would carry high-end watercolors on my journeys,–Schmincke watercolors. Schmincke colors are certainly extraordinary. The colors are lush, bright, and much more colorfast than Prang. But since I am an illustrator, not a “fine art” watercolorist, the Prang colors serve me well. If I get an image I like I can scan it before the colors fade. And though a watercolor purist would gag at the thought, I can also tweek the colors in Photoshop. Bottom line: The Prang set costs $1.99, a small Schmincke set can be found on sale for about $100. I also carried a Niji waterbrush. It looks gimmicky, but I like it. It has a reservoir that holds enough water in the handle to complete a fair-sized sketch. Sakura also makes an even smaller waterbrush called the Koi. These can be found for under $8, and while they don’t compare to high-end kolinski sable brushes, they are wonderful for use in the field. Note: Blog title today pays homage to Tim O’Brien’s Vietnam short story collection, The Things They Carried. I went on a sketch tour of Vietnam near the end of the war, in 1971. If I find some of my old Saigon sketches I will post them in the future. These are beautiful representations of the experience. The O’Brien book is one of my favorites of all time, so nice choice on the title.